We’d love your help. 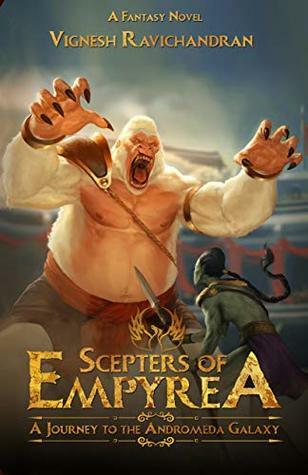 Let us know what’s wrong with this preview of Scepters of Empyrea by Vignesh Ravichandran. To ask other readers questions about Scepters of Empyrea, please sign up. May I know, how many years did it take to complete this book? I read this novel in the Kindle version. This is a debut fantasy novel written by the author Vignesh Ravichandran, this wonderful journey happens in the Andromeda Galaxy with lovely fantasy creatures. And, to my surprise, I found many of my childhood favorite characters like Dinosaurs, Anaconda, and mighty Kong. Its a complete set of happiness if you want to move out from your daily stress and live in the other world. Overall a very good fantasy story. One of my friends gifted this paperback edition of this to me on my birthday. It made me sink into the world of happiness from that moment. It was also adventures to fight against the Dinosaurs and Snakes. I also loved the character Kraity, it was wonderfully written by the author. I like to be a queen like her with the shape-shifting transformation power like her. The best Birthday gift of this year!!! This book is awesome for all the people who love fantasy . I just started to read this and I can't stop myself from flipping pages, from the start only you could imagine yourself in this kind of world and as the journey goes by you get too immersed in the book . Read it and pack yourself cause the journey is long. Well done. Author has a very nice imaginative storyline and the plot is also very interesting, however the writing style of the author can be more engaging. Overall a decent read, little slow but ok read.